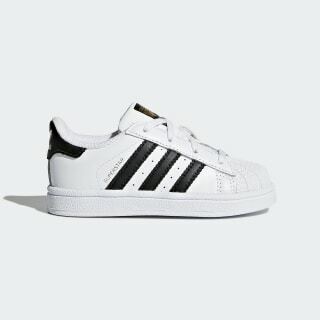 Toddlers' adidas Superstar shoes with an authentic look. A hit on the B-ball court and then the street, the Superstar has been crisscrossing the globe since 1969. These toddlers' shoes take all the authentic heritage details, like a rubber shell toe and serrated 3-Stripes, and shrink them down into a pair for little feet.